Cyber marketing term became popular when computers started getting used in marketing extensively. Earlier, computers were used more for storing, processing and reporting of various marketing related information. But, with the entry of internet the online data handling possibilities have virtually exploded the use of computer. This application has multiplied the use of computers at consumers’ homes faster than among the organisations. This fact has helped marketers substantially to look into cyber marketing. As a result, cyber marketing today is also seen more as internet based marketing rather than just computer based marketing. However, for our purpose, we shall define cyber marketing as that part of marketing which involves extensive use of computers, especially the internet. Cyber marketing profitably reinforces the concepts of marketing with the power of internet. Thus, it strengthens the existing delivery of marketing outputs and also opens newer avenues of marketing which were not possible to achieve before the arrival of internet. For example, a marketer today can keep track of millions of customers simultaneously, segment them online, offer customised products to individual customers, fix different prices, provide varying contents and styles of information and deliver the products through appropriate modes of distribution to each of these customers. The details of such transactions and the characteristics of each of these customers can be stored for their dynamic utilisation in future marketing opportunities with the customers. These possibilities were only the dreams of earlier marketers. Although cyber marketing comes with tremendous new the conceptual bases of conventional marketing need not be thrown away. The body of knowledge developed through the experiences and their theorization by marketers and the academicians are quite valuable. Moreover, they can also accommodate the new realities thrown open by the internet. Thus, for example, one can easily see the relevance of "marketing concept", "customer orientation”, "market segmentation”, "product positioning” and "market measurements” even in the internet era. Similarly the utility of marketing mix and all of its elements are very much present within cyber marketing. The formulation of each of the elements or the entire marketing mix may understandably be somewhat different froth the ones that might have been developed without the access to the internet. But, such differences are there even in any two different contexts of conventional marketing as well. i) Interconnectivity: Internet is often defined as a network of networks. Most of the users find it useful to have their presence recorded on the internet. They also ensure to become accessible by others through internet. By doing this, they help the count of internet sites to grow exponentially. The search engines on the internet are to facilitate internet usage and streamline traffic on the internet. But, by playing these very roles they help in attracting even more traffic to the internet. The increase in bandwidths and speed of internet connectivity are like converting country roads into expressways. All these factors have made interconnections among consumers and marketers possible at the levels never seen before. For customers the feature of interconnectivity translates as access to a very large number of diverse markets, other information sources and fellow customers. This access is universal overcoming all kinds of geographical boundaries. ii) Interactivity: Internet provides not just access to a large number of sites but also allows interface and interactivity among users. Internet can be seen as a virtual market on the web where the customers and marketers can most conveniently interact from their own locations and in a very cost effective way. This feature of internet provides a unique facility of interaction among a large number of customers themselves also through bulletin boards or chat facilities. The interactivity feature of internet allows the marketer to control the contents of materials that he would wish individual customers to access. This way cyber marketing gets its double edge in the market place. It allows the marketer to customise and focus even on individual customers in a mass market. On the other hand, the customers become empowered to scan much larger canvas of market and bargain for their purchasing power with a larger base of marketers. The customers can also create a large pool of knowledge by online sharing knowledge of their experience based knowledge among their peer customers. The interactivities gained by both marketers and customers have the potential of unleashing very high levels of energy in the marketplace restricted only by the creative limits of the market players. iii) Involvement: The internet user is not a casual user of medium like the TV viewer or radio listener. His attention is solely directed to this medium and is more committed to its contents as he has reached to the particular screen through a process of conscious search and choice. The medium is audio visual and therefore more attention centric. This increased level of involvement helps the cyber marketer to address his efforts to more serious customers. iv) Information: The sheer number of internet sites and the richness of content on each site have already made internet as the largest documented repository of information known to the mankind. Moreover, the information available on the internet is much better indexed than most of the alternatives sources of information. This has come as a highly leveraged resource for the cyber marketer. The richness of information on internet has also made customers perceive it as a more serious and informative channel of communication. This helps the cyber marketer as a better quality tool of connecting with the customers. Data based marketing, which had taken off even before the advent of internet, has really gone to greater heights through cyber marketing. On the other hand, because of the empowerment of customers through such rich information, database consuming has also found true meaning now. v) Individualisation: The advantage of mass customisation is made possible through internet for both customers and the marketers. The customers can identify the optimum provider for his unique sets of needs. Customer can also arrange for updating himself in the precise area of his interest although from the most extensive sources of information possible. The marketer can also store the historical data of customers and their behaviour. These data can be then processed with the help of data mining and marketing decision tools. These data are utilised to provide solutions to the customers’ needs on an online and individual basis. The product can be configured exacting to the individual customer’s needs at the price and with a payment mechanism most convenient to him. The information and the persuasive appeals can also be tailor made for the individual customer. He can be reminded or provided with additional services as per his specific requests and all these information can be utilised in the design of next round of offering to him. This kind of customisation when offered on continuous basis becomes service to the customer of significant commercial value. vi) Integrity: Internet provides tools to check the authenticity of the data and its providers. It can also go to great lengths for ensuring the privacy of its users. Both of these features result into greater faith among its users. Thus, customers get greater assurance about the transparency and reliability of the marketers' offers. Marketers can focus only on their best prospects with the knowledge that customer profiling have been achieved through more reliable means. The above mentioned aspects of internet arouse greater interests among the marketers. They tend to view cyber marketing differently. The marketers can now create the contents of their offers in more flexible and innovative ways. They can now communicate about their offers to the customers who are not bound by the traditional geographical limits. He can now create newer communities of customers having some common interests or need patterns. These communities can now be utilised as target market segments which are more strongly linked with the marketers. Better commercial business can be expected to result from these new kinds of marketer-customer linkages. In the above model the content from the marketers side are determined by the objectives of marketers, understanding of the customers profile and whether the target customer community already exists or needs to be created afresh. For example, some ethnic community may be already existing in India but may be difficult to access by marketers due to their geographical dispersal or lack of well directed media to reach such communities. Cyber marketing can overcome these limitations by converting these existing communities into cyber communities. Alternatively, marketer can bring together a new community bound by some common parameter of their interest or characteristic. The possibility of peer to peer communication on internet accelerates this community build up process in cyber marketing. Transactions can result much faster on the internet with these communities. This is further possible as the customers can approach the cyber market from the locations and timings of their convenience. Since the customers have the opportunity of scanning all the information of their relevance they are better prepared to transact when on internet. The speed of transaction can also be much more as a lot of customer related information may already retrievable with the marketer and need not be repeated every time the customer wishes to transact. Payment may be also be made electronically and for some of the products (like the digitised products) even the deliveries can be organised instantaneously and online. From the above discussion it is clear that cyber marketing takes a slightly different shape as compared to the conventional marketing. In order to understand these points of differences properly we shall now look at the individual areas of cyber marketing. i) Customer profiling, segmentation and targeting: Cyber marketing has the capability of viewing existing customers data through a wide variety of angles and compare the efficacy of each of these views. Various data mining tools available today are employed to do this job. They mainly utilise the processes of sorting, clustering and association seeking among the consumer characteristics. The history of the customer behaviour in terms of past transactions and internet viewing generate rich data for this purpose automatically. Such data are often supplemented with the offline data collected through alternative sources. The customer segments created with such methodologies can have the advantage of being more dynamic (because they can be created through online databases), more insightful (because of the use of more powerful clustering and association seeking techniques) and customers themselves selecting into a segment. The segmentation process in cyber marketing can be extended to real micro segmentation and even to the segments of single customers each. Each customer is individually identifiable and reachable at their personal addresses here. Therefore, the process of micro segmentation can be extended to its logical limit of mass customisation of marketing. In fact, the recent growth in the area of customer relationship management within marketing has been possible mainly due to the availability of these cyber marketing tools. ii) Product planning: In the markets today there are several products which maybe called as digitised products. The products whose main contents are information fall in this category. Financial products, softwares, books, audio and video products are examples of products which are already available in digitised forms or are very easily amenable to be converted into. These digitised products can directly be displayed, presented and even delivered through internet. Even those products which are more physical do have digitisable components. The digitisable components of such products can take the advantage of mounting on the cyber marketing platform directly. Another interesting product related possibility through cyber marketing is regarding product customisation. Marketers can also bring in the product optimisation tools which can simultaneously look at the customers needs and the marketers objectives and achieve them. Thus, for example, the marketer can estimate the profitabilities at the various levels of customisation and offer that level of customisation which satisfies his own objectives the best. iii) Branding: Products on the internet can benefit as much as any other product from proper branding. The rapid proliferation of internet based products gathers a very large clutter of brands in least amount of time. In such situations the power of brand identity becomes even more indispensable. iv) Pricing decisions: The fact that customers can compare much larger range of offers and their prices has suggested that cyber marketing exerts downward pressure on prices in the marketplace. Internet provides a large array of data about the different products prices and corresponding sets of features. These information assist customers to more easily sort out less valuable features of the product from the more valuable ones today. They can also evaluate the real worth of products when the market is flooded with a complex array of products with varying features. The customers can also utilise the wisdom of fellow customers for this purpose. In all, internet tends to make a wiser customer out of the ordinary. Even widely dispersed and otherwise unknown to each other customers can also pool their purchasing power on internet. This purchasing power can help them to resort to "reverse auction" and secure best possible price deals from the marketers. While customers get the benefit of better price information and bargaining, cyber marketer can also see opportunities in it. First of all, the seller can apply price discrimination much more fiercely and dynamically because the seller can now deal with each customer more on one to one basis. The seller can also optimise on price and profit realisation using the customer related data and the internal data about items such as inventory levels, incremental costs and competitive strategy followed. It also allows the marketer to better concentrate on the life time price realisation from a customer rather than just the benefit through immediate transaction. Another significant advantage offered by cyber marketing is about the ease and speed of price collection from the customers. The electronic money transfers from the customers to marketers can take away considerable pain of collections and accounting. v) Advertising and Sales Promotions: Like products and prices, customisation of advertising and promotion are very much possible in cyber marketing. Besides customisation, the customer is contacted when he is giving full attention to the computer screen. In fact, when a customer views any site he has done so after deliberate and conscious effort and choice. This increases his commitment to the message that he is viewing on the internet. Advertising generates a hierarchy of impacts like creation of awareness, interest, desire and action on the consumer. Different media are found to be better suited for certain kinds of impacts out of this hierarchy. Internet has been found to be amenable to fine tuning for most of these impacts. As a result, it is possible to better transport the customer from one level of impact to the next higher one and do so more quickly. The combination of this factor with the feature of individualisation makes the output very powerful one. Besides this, the measurement of each of these impacts are also possible more easily and online. The promotions on internet can also be customised in a similar way. 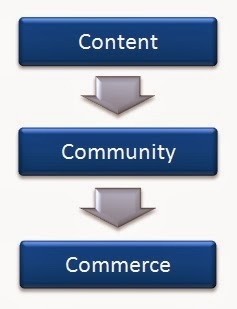 The cyber marketing model shown earlier (Fig.1) suggests that commerce follows content and community. Since the internet phenomenon has occurred like an explosion there had been quite a rush to build up communities in the competitive environment. In this rush, many of the marketers tried to buy prospective customers into their communities net by offering a variety of incentives. This has caused cyber marketing effort to be seen as overloaded with freebies in the form of consumer promotions. vi) Distribution: Cyber marketing is often seen as attacking on the length of the distribution chain. This is explained as internet is seen to be overtaking some of the distribution intermediaries tasks, particularly the information flow related ones, much more efficiently and instantaneously. As a result it is often possible to reorganise the distribution chain at the cost of its length. The span of control can also increase considerably as many of the control related processes can be transferred to the computer. The saving in costs due to these effects are often considered as the most important contributions of cyber marketing. The increased availability of distribution related information can also cause information overload to the consumers. Therefore, a new category of channel members, called "infomediaries", have also emerged. These infomediaries primarily consolidate the relevant information about the availability of the products and pass them on to the consumers after suitably repackaging them. Besides pure infomediaries, the existing distributors do also rebundle their services after integrating the online and offline elements of their services. Internet also enables online distribution of digitised products. This helps in extending pinpointed reach to a large number of customers, eliminating the lead time between ordering and delivery, reducing the inventory requirements and smooth organisation of transaction related data processing. Recently, many organisations have adopted Enterprise Resource Planning (ERP) systems for their management. Cyber distribution activities, when linked to these ERP systems, enable the companies to achieve utmost efficiencies in their entire Supply Chain Management. vii) Marketing Research: Customer interface with the marketers site on the internet itself generates substantial market research data. The online nature of such data make them inexpensive, timely, transcription errors free, authentic and unobtrusive. Some data are also generated by the customers as they leave traces of their internet usage. These data are closest to the naturally emanating data without any outside tampering. Data on internet also enable the marketer to discover the associations between customer behavior and various other preferences and actions of the customers exhibited on the internet. These kinds of data are often unique to cyber marketing and cannot be collected through any traditional means of marketing research. Specific marketing research can also be conducted on internet. In such researches respondents qualifying on a host of parameters can be reached with relative ease. The number of sampling parameters can often be much larger than what is possible through conventional modes of data collection. Such targeted respondents can be reached with customised instruments and during the timings of their convenience. Various computer assisted data collection tools available today can be easily used to customise these research instruments. These tools can also be embedded with data processing softwares. As a result, the respondents can be asked fewer but more relevant questions making the task of data collection easier and more efficient. I definitely loved every bit of it and I have you bookmarked to look at new information on your website.